There's always a hoodie on my list, right? I searched for one I saw last week, but it seems to be gone already (the red one with the elf hat that says, "The best way to spread Christmas cheer is singing loud for all to hear"), so I've moved on. 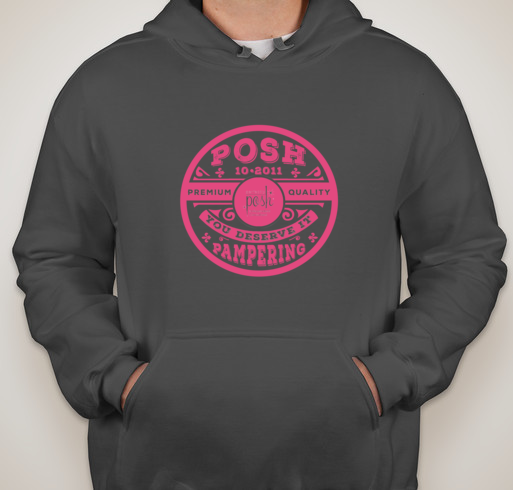 While I don't know all the details, some Perfectly Posh leaders are selling these as a fundraiser. I think they're doing something fabulous with the money to help out locals in St Thomas on their incentive trip in January. Have you seen my other actual Posh branded hoodie? It's YELLOW. I mean, super-fluorescent yellow. I'd be able to wear this charcoal one (in a size medium) a little more discreetly. Want to see why I'm so wild about Posh? - Check out my site here! Wonderful products, economically priced, and so pampering. These hoodie things are called wallabies in the knitting world. i made one for each of your littles. Maybe I'll get your measurements and color request and make you one. I've never heard of Posh before, but the beauty products are right up my alley! I love the color scheme of that hoodie. Definitely something I would wear. Lovely hoodie! Looks great and comfortable to wear. I've never heard of that before. I might check it out!